The Art Of Holiday Cheer: A Window Into Storefront Displays During the holidays, a number of retailers deck their windows to lure shoppers off the sidewalk. At Lord and Taylor in New York City, a team has been planning this year's display since February. "There's about 320 gingerbread men in there," Roe Palermo says. "They're made out of foam — they're made out of magic, come on!" In December, it's all but impossible to avoid brushing shoulders with holiday cheer. Tinsel, garlands, wreaths and twinkling lights — it can often seem the decorations are everywhere. Among the most famous of these many attractions are the window displays at Lord and Taylor, on the busy Fifth Avenue sidewalk in New York City. They're far more complicated than a few mannequins in Santa suits; they're more like festive pieces of art. In one window, there's a sweet shop full of cakes and baked goods on a spinning conveyor belt, all while the doors of an advent calendar swing open and shut to music. Roe Palermo is the person who figures out what goes into the Christmas window displays each year. She's the divisional vice president for visuals at Lord and Taylor, and she has a history with these windows. "My Aunt Joan, she would always buy me my special dress from Lord and Taylor," Palermo says. "Also, she would always bring me to see New York holiday windows since I was like 5." Palermo takes me on a tour of the workshop where these displays are built, directly beneath the window shoppers on the sidewalk. It resembles a graveyard of holidays past. There are cardboard pine cone cutouts covered in glitter and boxes upon boxes of plastic Canadian geese, which Palermo's team used to decorate several displays this year. "It feels like we're going into a secret cave," Palermo quips. We stop in front of an elevator that lifts one of this year's displays to street level. "You can see the cuckoo clock and the acorn-pendulum swinging and part of the video monitor," she says. "When we go upstairs you'll see the big, grandiose cuckoo clock." The cuckoo clock is showcased in one of five Lord and Taylor window displays. At midnight, a fireworks animation explodes in the background. 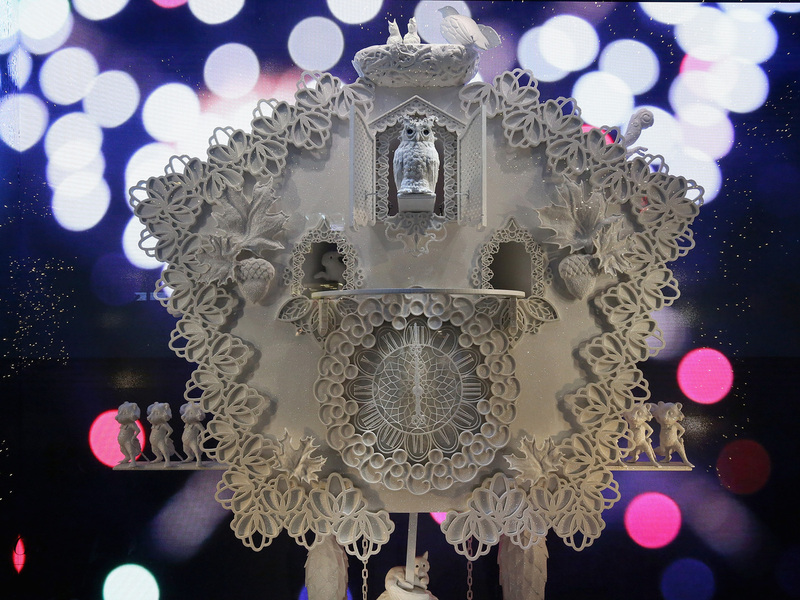 The sparkly white cuckoo clock is one of five windows that Lord and Taylor unveils every December. Everything on the clock glitters. Squirrels run up the sides, while other creatures nestle into little nooks in the clock. At midnight, an animation of colorful fireworks explode in the background. From the street, the windows glimmer. 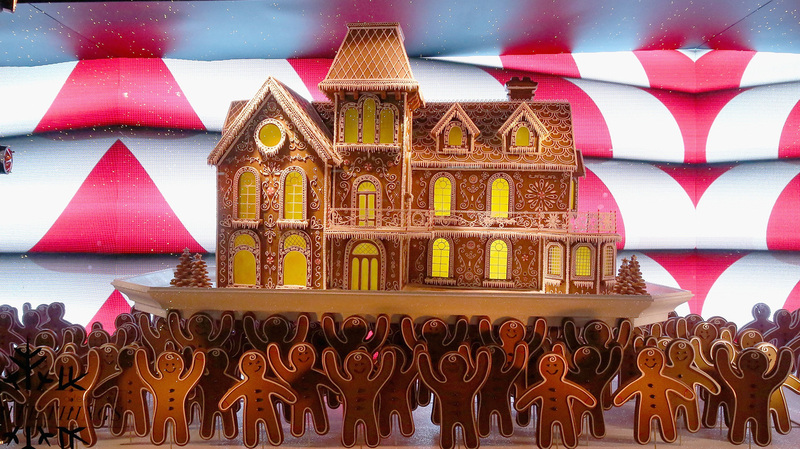 Another window houses dancing gingerbread men. "There's about 320 gingerbread men in there," she says. "They're made out of foam — they're made out of magic, come on!" Palermo and her team start planning each year's displays in February and come up with about 10 good ideas. Then they do story boards, figure out the mechanics of each and pick the best ones. As soon as the displays are up, Palermo, starts thinking about next year's designs (though, honestly, she never wants to take them down). And she says the payoff is huge. "People stop, and all of a sudden — 'Oh wow, look at this.' And then they start looking at the windows," Palermo says. "Then that brings back a memory. And even if its just for two minutes or two seconds, it made someone during their hectic day smile." This year, part of the building has been under construction, and scaffolding hid Lord and Taylor's famous windows from the street. Palermo's solution? Cover all the scaffolding entirely in garland and Christmas lights. It looks like a winter wonderland.